ALL NEW 100% SAFE FOR THE OZONE. NO CFC'S. NO HCFC'S. NO PROPANE. NO BUTANE!!! 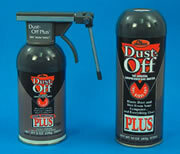 Here at Electron Microscopy Sciences, we are proud to introduce a new line of 100% ozone-safe pressurized duster products. 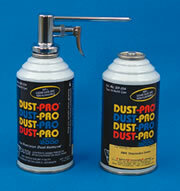 This new formulation, DIFLUOROETHANE, delivers pure, moisture-free blasts which removes all dust and dirt particles. This new formulation is considered non-flammable (Formula S), and completely safe for normal use, however this formula is considered flammable for shipping purposes and does contain some flammable elements. For special applications, where flammable elements are prohibited, we do have available a special application formula, Tetrafluoroethane, (Formula N) which has been specially formulated with no flammable elements. Unfortunately, the propellant cost of this formulation is significantly higher. However, all of our new gases are very low in pressure, so you get many more blasts per ounce. In fact, the new canisters will yield 20% more blasts than the old ones. This is true even though these new cans contain 8 ozs and the old ones contained 12 ozs. Contains: Formula S (Difluoroethane) - 100% safe for the ozone. It uses the same chrome nozzle as the old FG Dust-Off. The nozzle is designed to prevent droplets from forming. It retains the same pressure until the can is empty. Its new concentrated formula will give you 57% more blasts per ounce, 17% more blasts per can. The kit consists of a 8 oz. can and a chrome nozzle. Refill is 8 oz can, 12 cans/case. Contains: Formula S (Difluoroethane) - 100% safe for the ozone. It comes with a patented 360° Vector Valve. The multi-directional valve is used for easy blasting in hard to reach areas. The valve can be removed from the can anytime without any loss of gas. Its new concentrated formula will give you 57% more blasts per ounce, 17% more blasts per can. The kit consists of a 8 oz. can and a Vector Valve nozzle. Contains: Formula N (Tetrafluoroethane) - 100% safe for the ozone. The same as DPSA above but this formula-as mentioned-contains no flammable elements. Contains: Formula S (Difluoroethane) - 100% safe for the ozone. The first safe-for-the-environment disposable pressurized duster. Removes dust and dirt with pure moisture free blasts. There is more product at less cost per ounce. Extension tube is included with the can. Its new concentrated formula will give you 57% more blasts per ounce, 17% more blasts per can. Contains: Formula N (Tetrafluoroethane) - 100% safe for the ozone. The same as DPXL above but this formula contains no flammable elements. 100% Safe for the ozone! For dusting use in the upright position. For chilling a specimen invert the can and spray in short bursts. The kit includes one 8 oz. can Dust-Pro and Peca Techni-Valve (TM). The one-piece-valve is made from solid brass and is chrome plated with an extra long nozzle (3½") for hard-to-reach areas. No mounting clip is required. The valve can be removed at any time without loss of pressure. Use with Peca Techni-Valve; 8 oz. can, 12 cans/case. An 8 oz. can containing non-flammable Tetrafluoroethane; 100% ozone safe. Comes with an Acc-u-sol™ trigger for pinpoint accuracy in cleaning as well as chilling procedures. 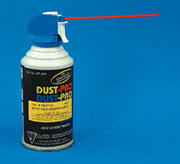 For use with our Dust-Pro Refill cans. Model B sprayers are available in 16 and 8 oz. Capacities. 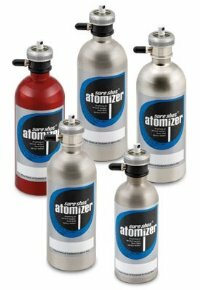 Anything that the aerosol can do, ATOMIZER can do safer. Refillable and Rechargeable. 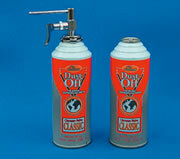 Eliminates aerosol disposal problems. All Model B sprayers come standard with Viton® seals, these seals are compatible with most products. IMPORTANT: Sure Shot® Sprayers are not recommended for spraying any acids. Sure Shot® Sprayers will handle most chemicals, but are not designed to be used with products that are intended to etch or attack metal surfaces. Pressurize the Sure Shot® Sprayers with this rechargeable battery powered Air Compressor. The Compressor generates up to 220 PSI, the battery recharge unit by the AC 115V adapter or DC 12V adapter included. Completely portable, no trailing cords.